Book Sizes and Taking Advantage of Bald Men. They are the most commonly used. There are a myriad of variations within each theme “Crown Octavo”, “Elephant Folio” , “Royal Quarto”, “Small..”, “Squat..” etc. These are usually tied to bibliographical descriptions from SOMEONE OLD AND DISTINGUISHED tm. who wrote about this book eighty years ago and whose word has been taken ever since. (Bibliography based ranting will follow on another day). You might wonder why we can’t just say “It’s nine inches or so.” (generally when you hear this, it’s a lie), and indeed there is a gradual modern book cataloguing trend towards just giving an imperial or metric measurement. This is fine, it’s a bit sad, but it’s fine. I tend to think that most old books were “designed” with a specific impression in mind (even if the motivator was merely avarice), and if it was designed as a Royal Octavo, then that is how it should be described, even if you then add the rider “7 inches by 6 and a half”. 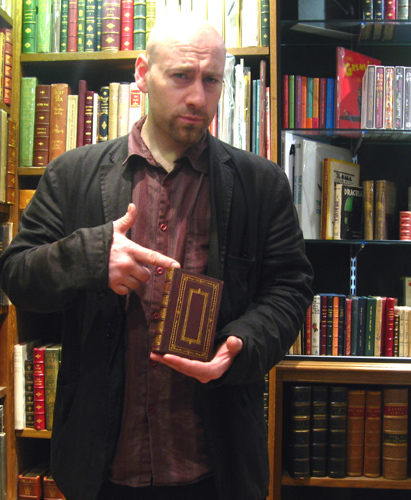 I am holding a small book, do not try this at home. It is far safer to use a kindle. Our glamorous assistant (come on, have you seen the state of the economy? ), is holding a calf half-bound 16mo (sextodecimo) volume. As you can see it is having no effect on the glamorousness at all. This was a particularly common eighteenth century format (not exclusively! Calm down) as the increase in readily available and efficient transport made reading whilst post-chaising to Brighton a possibility rather than an exercise in endurance and courage. In this glorious example of the photographic art (behind the shades of Robert Capa and Henri Cartier Bresson howling in rage) you will see that the odd bald man is holding a 12mo (duodecimo) volume. This (amongst many other examples) would be the general size of a Jane Austen first edition for example. It is dangerous to go alone: take this. 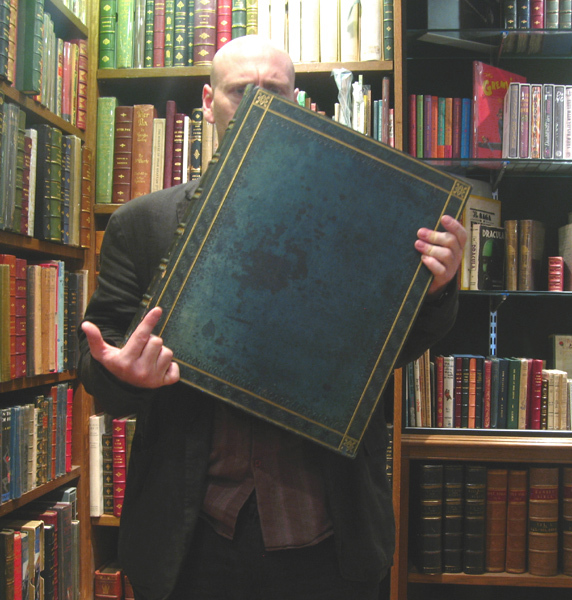 Here we have an example of the most common book size: the fabled Octavo (8v0). It has always been the most handy format for books, probably 8 out of 10 books in this shop are octavo in one flavour or another, as are airport paperbacks, standard modern hardbacks and frequently everything else from Conan Doyle to Shakespeare. 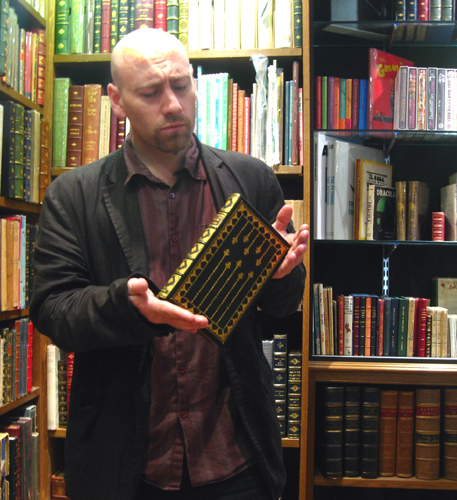 Trust me, I’m a bookdealer, this is the book you want. Next up is the quarto (4to), somewhat larger and heavier than the octavo, for a variety of reasons this size is beloved of eighteenth and nineteenth century creators of travel books; everything from Cook’s Voyages to Franklin’s Journey to the Polar Seas can be found in this size. The book being held by the scary man is in fact John Barrow’s copy of the Travels of Marco Polo, thus adding weight to my somewhat tenuous point. The quarto is beloved of people who want to produce books full of elaborate folding maps and charts. And God books. frequently seen in quarto is God. Disapproving man activates Disapproval Face! This object is a Small Folio (Sm Fo or 2°), it is also in a very lovely full red morocco “armorial” binding (more on those later) bearing the badge of a presumably rather wealthy cardinal (is there any other sort?). I have many leather bound books, and my apartment smells of rich mahogany. Large folio (Lg Fo, etc.). Large, impressive, suitably difficult to shelve. A nightmare to ship, but excellent for hiding unsightly bookdealers behind. That’s a very quick run down of the more commonly catalogued sizes, just as a quick reference. 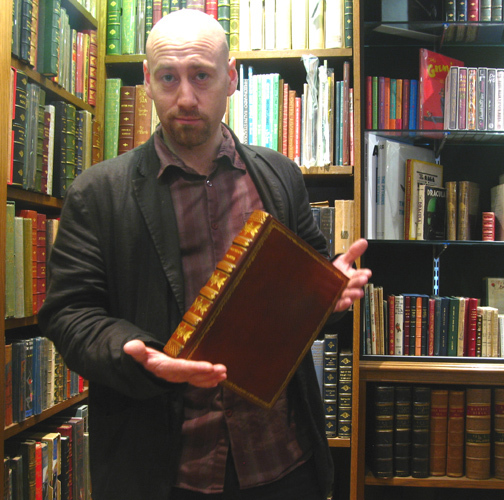 Should you wish to obtain your own bald man to use as a sizing guide he is available for hire and will accompany you to various bookshops and hold books for your delectation and education. For a small fee. This entry was posted on Monday, July 4th, 2011 at 12:12 pm	and posted in Book Trivia. You can follow any responses to this entry through the RSS 2.0 feed. Octavo; quarto; folio, et cetera, indicate how the sheets were folded, before inclusion as gatherings in volumes; by themselves these terms are not indicative of size. There are larger and smaller quarto’s; and larger and smaller octavo’s. Book size is described by a two part term; for example, demy octavo; demy quarto; imperial octavo; and post octavo. The first element of the two part term describes the size of the sheet that was used in the printing process. In England, foolscap was amongst the smallest sheets used, and imperial was amongst the largest. Demy was a mid-sized sheet. To complicate matters, there were slight variations in the sizes of the sheets, there was no clear standard – there were large demy sheets, and small demy sheets, for example. Once the sheets that were used were folded, depending on folding method, – in folio, octavo – do we arive at book size. A foolscap octavo is far smaller than an imperial octavo: because the foolscap sheet is far smaller than an imperial sheet, and the sheets of both had been folded in the same manner, octavo. 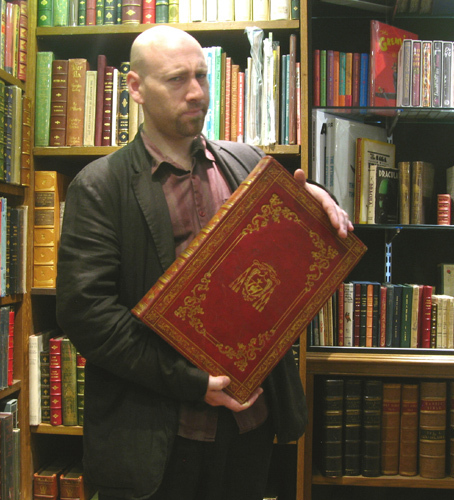 A foolscap folio is smaller than an imperial quarto. An imperial octavo is only marginally smaller than a foolscap folio. A demy octavo is only a little smaller than a foolscap quarto. When reading a book dealer’s description, terms such as quarto,and octavo, should only ever tell us how the gatherings had been folded; not how large the book is. It is difficult and time consuming to determine exactly which sheet had been used in the printing process, so book dealers of old had simplified matters by describing copies as large or small octavo’s; and large or small quarto’s. The size of some editions are famed, and the correct description remains in use. 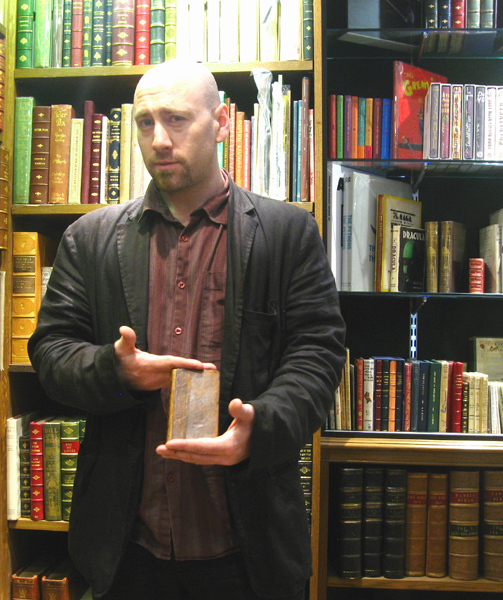 Dickens’s demy octavo’s are amongst the most recognisable of book sizes, for example. In the literature of the day, titles were advertised, as to their size, and when these are still known, they are often included in the descriptions of book dealer’s stock. When the folding of sheets had become superseded by other technologies during the twentieth century, attempts were made to standardise the two term descriptions as sizes in inches; and these vary from one source to the next, are still wrapped in confusion, and are without any real use.